Summary: Solar water heating systems guide, advantages of solar water heating and disadvantages of solar water heating. Water can be heated within your home with the aid of solar power generated from the sun. The suns heat is collected by solar panels, also known as collectors, which are usually situated on a roof. When the water needs heating up further to meet requirements, the solar panels will work in conjunction with the existing heating system you have already. Solar powered heat is usually used to heat water for your hot taps as opposed to the central heating system, including radiators. Solar power can produce up to 50% of the hot water for taps, baths and showers in your home. This is about 12.5% of the average yearly heating/hot water bill. There are no further costs once the equipment has been installed as they collect the sun’s heat. 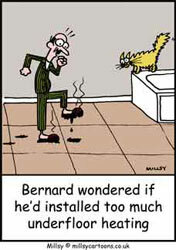 The panels need very little maintenance, so cost of servicing is not required. No planning permission is required in England. It is thought that the rest of the UK will follow suit in scrapping planning permission for solar panels. The initial costs of installing solar panels are high. Although little maintenance is needed in future as they are pretty simple pieces of equipment. The panels are only usually worth adding to houses that are south-east to south-west facing, with roofs that are suitably pitched. There must also be unobstructed access to the sun, for example the absence of trees. Solar heating cannot supply all of the heating needs in a property, so other heating systems are required. Join an existing conversation or create a new thread related to Plumbing and heating in our DIY forum.